While they’re still a minority of the mobile phones carried by people worldwide and within the United States, smart phones are quickly becoming a part of daily life for many people. A smart phone is used just like a dumb or feature phone: they make phone calls and receive text messages. But they also do much more, like offering a full HTML browser that replicates the desktop web experience on your phone. They also have applications. 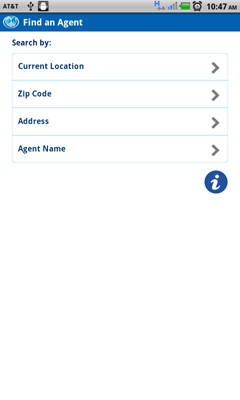 Applications to check the weather, find the lowest price on gasoline, order pizza, report the locations of potholes on our roadways and even advanced games you can play on your phone. While smart phones should never be used while driving, many car insurance companies have developed applications for client services on smart phones. These apps provide customers of the car insurance companies to file claims and more. So what makes for a good car insurance smart phone application? Any good car insurance smart phone application will have a function to allow you to file claims. And since a claim can be as simple as broken automotive glass, a good app will offer a myriad of choices, including being able to file an accident claim, as well as simple claims, like broken glass. 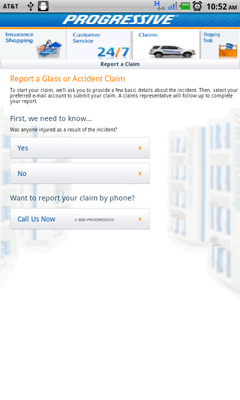 While claim filing is a given, apps that allow you to document collisions and accidents are even better. 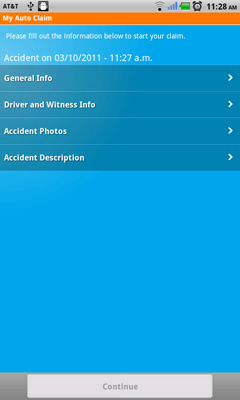 You should be able to give details about the accident as well as providing pictures of the accident. Your insurer can provide much better service equipped with as much information about an accident as possible. 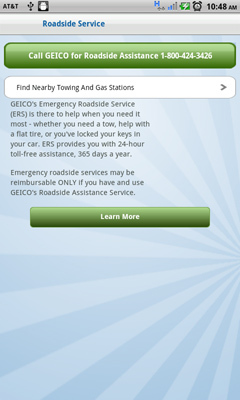 Nationwide's app allows you to upload pictures as well as provide other details about an accident. If you’ve been involved in a wreck, getting help quickly or getting roadside assistance is a must of a good car insurance app. This should include a one touch call to 911 and less urgent roadside assistance functions as well. One of the reasons we have insurance is to allow us to get back to our normal lives after an accident or wreck. 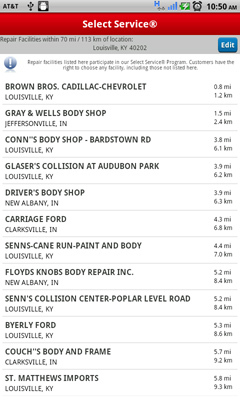 Good car insurance apps will feature locations of service providers you can use to repair the damages to your car. Some folks prefer to file claims with the agent they deal with. And if they’re away from home, they’d still prefer to have a human handle their claim. Thus, any good car insurance smart phone application should allow you to find and contact an agent directly. Finally, and good car insurance app will allow you to do things that don’t involve an accident or a claim. 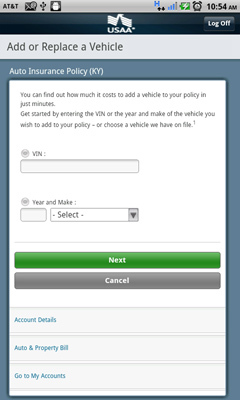 You should be able to change your policy, add or replace vehicles and more. While every car insurance app doesn’t include each of these six features, many of the smart phone apps from the larger insurers do allow you to do each of these things. Consider these apps a bonus feature of your coverage, and if your smart phone is never out of your reach, you may want to give your auto insurer’s version a try.